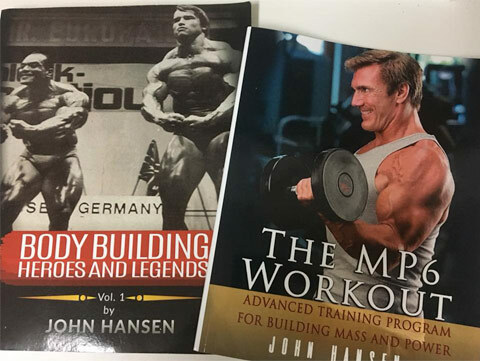 Get a FREE Copy of my new Ebook “Training Methods for Gaining Size” with the Purchase of my 2 New Books – Bodybuilding Heroes and Legends: Vol One and The MP6 Workout! Recaptures the glory years of bodybuilding. This was the era in which legends such as Schwarzenegger, Oliva, Zane, Robinson, Szkalak and Mentzer battled it out on stage for the biggest titles in the sport. These iconic confrontations are captured in illustrious detail, showcasing the colorful personalities with their larger than life physiques who fought hard won battles in the gym before displaying their bodies onstage to the delight of their limited but enthusiastic and loyal fan base. Some of the most exciting bodybuilding competitions in the history of the sport are included along with the amazing bodybuilders who became legends. Read about the iconic battles between The Myth and the Austrian Oak, the backstage politics, Frank Zane’s rise to the top of the sport, the fiercely independent Kal Szkalak and the inside scoop of one of the most controversial contests ever, the 1980 Mr. Olympia. The MP6 Workout is an Advanced Training Program for those who want to get both Bigger and Stronger. The concept of cycling your training by progressively adding more resistance is a concept that has worked for the best bodybuilders of the world. The MP6 Workout Program consists of using both Power and Mass Cycles for six weeks each to make impressive gains in strength and muscle mass. Bodybuilding Heroes and Legends Volume One & The MP6 Workout. Get Training Methods for Gaining Size FREE! Get a FREE Copy of my new Ebook “Training Methods for Gaining Size” with the Purchase of Bodybuilding Heroes and Legends: Vol One and The MP6 Workout for only $45 (including postage)! U.S. orders only. Learn the different training techniques for increasing intensity in your workouts. John details the most effective training methods for building muscle that he has learned in his lifetime of working out. Get your copy of this Ebook for free with the purchase of the Bodybuilding Heroes and Legends: Vol One and The MP6 Workout.